Humans have always been collectors. Prehistoric graves contain heaps of shiny pebbles, rudimentary jewelry, and other items that bear millennial witness to our gathering instinct. The Egyptians, master accumulators indeed, truly believed that they could take it with them and, in attempting to do so, left an impressive record of their civilization. I, too, am a gatherer: Among other pursuits, I am a collector of postcards. I have spent more than thirty-five years as a deltiologist roaming the world, always on the lookout for the little piece of pasteboard that would complete my collection, add another valence to its scope, or just plain make me smile with delight. Deltiology, the hobby of collecting postcards, began as a pursuit in the latter half of the nineteenth century. 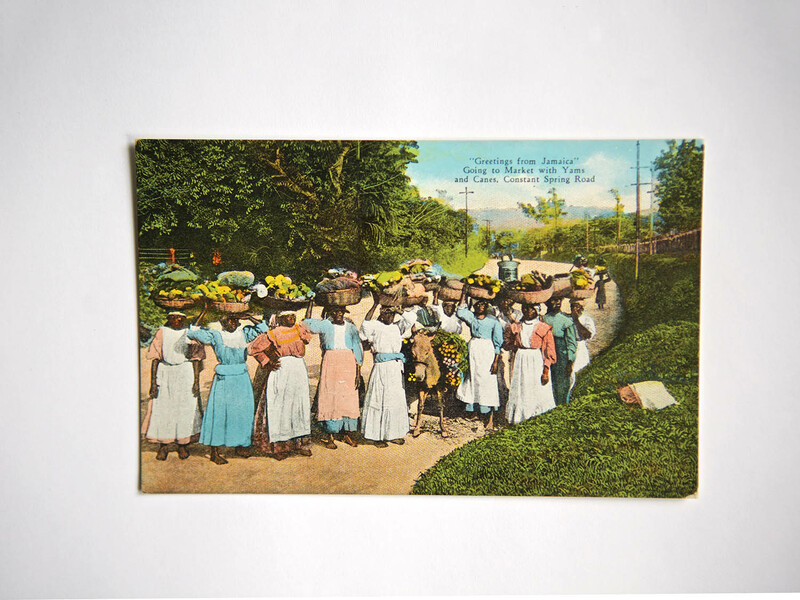 Postcards were developed in the 1860s and became wildly popular by the early twentieth century; their images, even more than the messages they carry, bear witness to how entire cultures have changed. In the United States, they document postbellum agricultural pursuits and the growth of cities after the Civil War. In Africa and the Caribbean, they provide a visual record of the apogee and decline of colonialism. The small rectangular pasteboard souvenirs house memory; they are photographic witnesses of a world that was and is no more. Early postcards were designed for European and American markets and reveal the prevailing prejudices and predilections of their period. As photography hadn’t then attained a dominant sense of conscious social commentary (excepting the battlefield photography of Mathew Brady and the like), many early postcards were posed. Some postcard scholars wrestle with questions of photographers’ intent and Europe’s view of the “other.” They focus on the details revealed in the photographs: the shape of a head-tie, the fabric of a dress, the gesture of a hand, and the use of a tool. Whatever the point of view, it is undeniable that the cards reveal innumerable aspects of material culture. In them, we see art, craft, and design. The cards can also reanimate destroyed buildings and streets long forgotten, the dress of bygone eras, and practices fallen out of use. Most important, they provide a narrative lens for understanding the lives of those who have gone before, captured for eternity in the dignity of their work, the calm of their repose, and the joy of their festive occasions. My postcard journey began as I was working on my doctoral dissertation on the French-speaking theater of Senegal. I journeyed to that West African nation to do my preliminary research in the early 1970s. 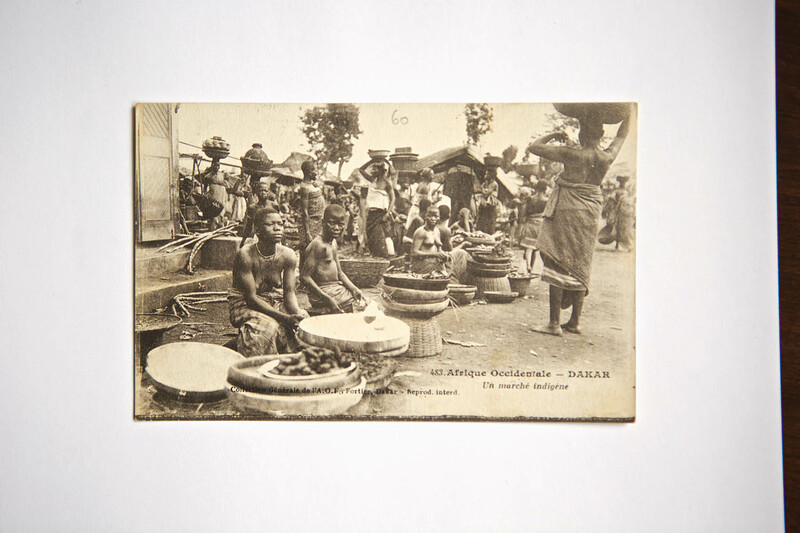 There, I discovered several books that reprinted antiquarian postcards of West African scenes and presented a vivid photographic memorial of the way things had been. Many were images taken by Francois-Edmond Fortier, a Frenchman who was an early documentary photographer and ethnographer and published more than 3,000 postcards of French West Africa during his lifetime. Through his camera, the dusty streets of Senegal’s past sprang vividly to life. 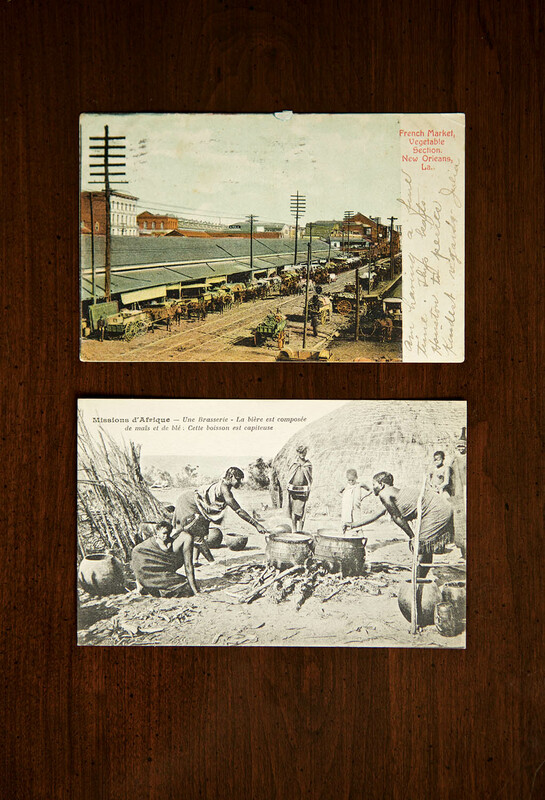 I was captivated by the postcards’ ability to fix the past into visual view. 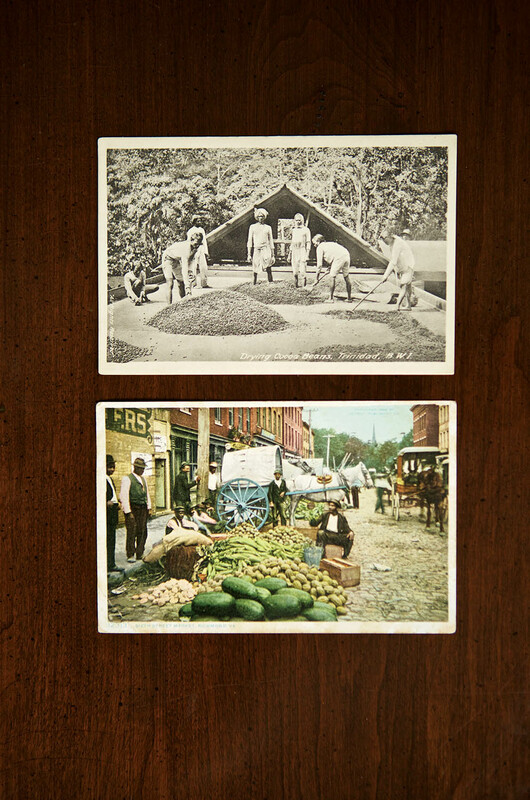 I began collecting cards that appealed to me: a street scene here, a marketplace there. I ended up illustrating my dissertation with postcards and other ephemera. The focus of my major collection evolved in 1993 when I was at work on my fifth cookbook, The Welcome Table: African-American Heritage Cooking. Charged with finding illustrations to complete the work, I knew that I again wanted postcards: archival images that would convey the depth of history and give a visual portrayal of the past. By then, my work in the world of food had defined my collecting interest as well. 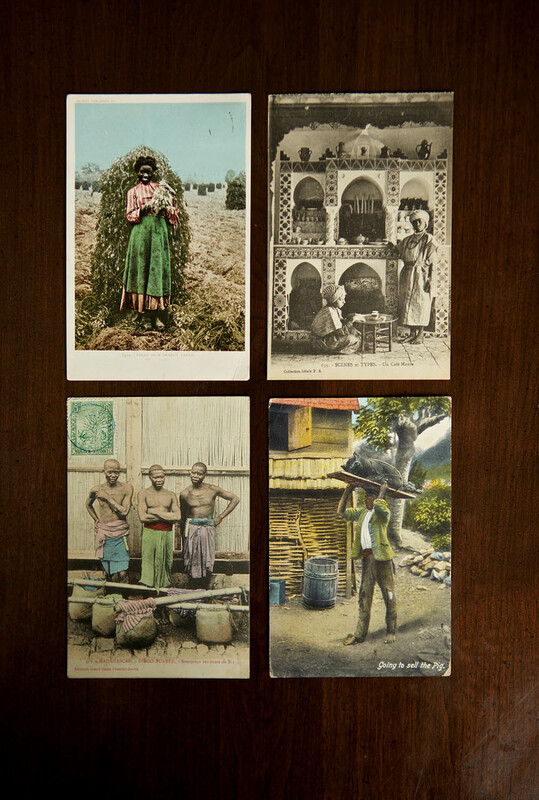 The years had narrowed my collecting down to postcards depicting Africans in their homeland and in the diaspora with food: fishing, farming, vending, serving, and consuming. I also collected images of celebrations: dances, dinners, and religious and cultural ceremonies. Each subcategory offers not only a view into how things were done in a place-specific past but, when examined across regional areas, can also offer ample opportunity for cross-cultural comparison. French cards from western Africa dominate the collection. But there are cards from all parts of the African continent, including some recently acquired ones from early twentieth-century Djibouti. 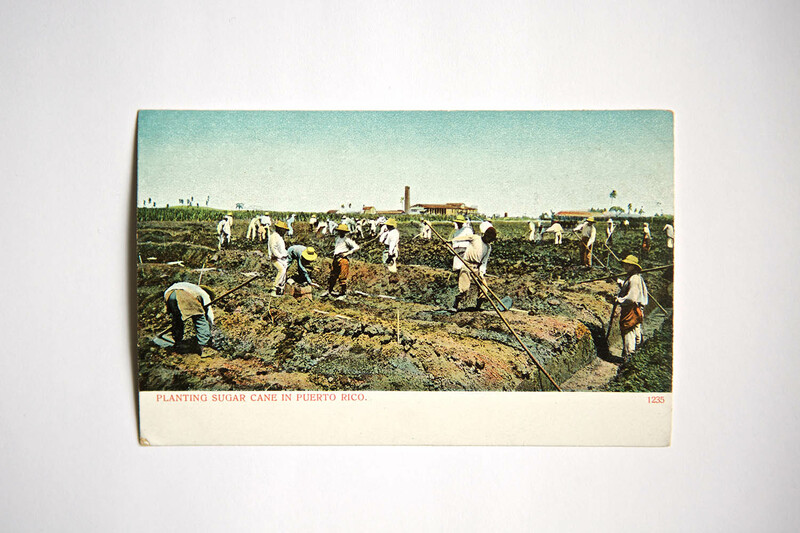 There are also Caribbean scenes from Jamaica and Barbados, Puerto Rico, Martinique, Guadeloupe, and Cuba, as well as cards from Mexico, Brazil, and other spots in Latin America. There is a parallel group of cards from the southern United States. Acquiring cards from each area required a different collecting methodology, as cards are usually found in the zones to which they were sent, not their areas of origin. Cards were purchased in Paris, London, Brussels, Barbados, Jamaica, Brazil, Senegal, and throughout the United States. In the US, black memorabilia has become a highly desirable field of collecting. However, when my collecting began, few were focusing on the culinary side of things. Looking for early cards of African Americans in the United States, however, was and remains fraught because of the racism of the period. Many images of blacks were designed to uphold the prevailing political attitudes and social conventions. In fact, some are not only racist, but also deeply disturbing and violent. As a collector, I made a conscious decision to select only those caricatured cards that are benign or that demonstrate the ongoing connections that some culturally charged foods—watermelon, chicken, possum—have with African Americans. In the realm of celebration and recreation, I have added only those that depict dances, musical performances, and games where blacks are the central participants. Almost all of my books since The Welcome Table (1995) have been illustrated with postcards from my collection, and each new book has offered the opportunity to broaden the collection’s scope. The Africa Cookbook: Tastes of a Continent (1998) made good use of many of my original African cards and required the acquisition of cards from northern, southern, and eastern Africa. Beyond Gumbo: Creole Fusion Food from the Atlantic Rim (2003) allowed me to widen my collection to include cards from Caribbean islands, Mexico, and Central and South America. Rum Drinks: 50 Caribbean Cocktails, from Cuba Libre to Rum Daisy (2009) began a collection on sugarcane cultivation—an agricultural pursuit that is amply documented in cards from the Caribbean region, South America, and southern Louisiana. At the time that I began the collection, I was unaware of the scope of research possibilities offered by the cards; I simply loved the images and the manner in which they brought the past to life. Over the years, I have become intrigued by the opportunities for cross-cultural research that they offer in subjects ranging from dress and ornament to agricultural methods. A strawberry picker in the American South balances her basket atop her head with the same aplomb as a market woman in Barbados displays her wares. The hoe used in one image turns up again in another image a world away. A woman loading coal for the French Transatlantique shipping line displays the same classic double hitch seen on the skirt of a southern Louisiana sugarcane worker—one of the vestimentary connectors of working women of African descent in the New World diaspora. I spent years misclassifying a sugarcane-cutting scene as Puerto Rican only to finally realize that it was southern Louisianan, so similar were the conditions. Random juxtapositions often bring cross-cultural connections to life in a startlingly vivid manner. Academic researchers see the value of such collections, too. My images formed one of the inaugural exhibits at the Southern Food and Beverage Museum in New Orleans, and several others are a part of the permanent collection of the nascent Smithsonian National Museum of African American History and Culture in Washington, DC, where they are used for study and in the exhibits. Two hundred of them will form the subject of a forthcoming book, In the Dignity of Their Work and the Joy of Their Play, which presents the collection as an archival resource. Where do I find postcards? From innumerable sources around the world, ranging from flea markets and antiquarian booksellers to professional dealers whose collections amount to archives themselves. 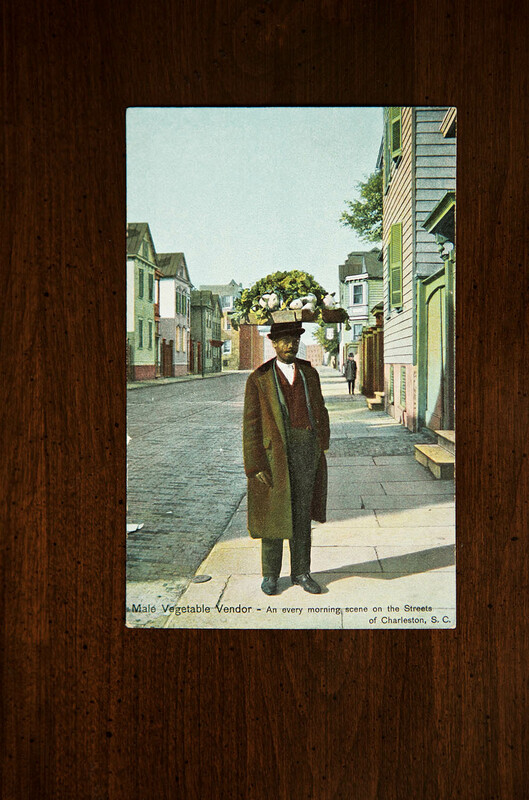 Cards from the early epoch have become increasingly rare, and the cost of individual cards continues to grow as postcard collecting has grown in popularity among lovers of black memorabilia. Changes in the market and the unavailability and prohibitive pricing of some cards caused me to branch out. My collection now ranges beyond the culinary into other tangential areas. I wish I could say that I am no longer collecting cards, but that would be a lie. I find it impossible to pass up a gorgeous card. It’s been a lifetime love and an enduring education.